To make the stuffing: Heat the oil and butter in a frying pan, add the onion and fry gently for 10 mins until softened. Take off the heat. Stir in the rest of the ingredients. Make deep cuts in the lamb at 5cm (2in) intervals and push in about half the stuffing. Tie string around the joint to hold it together. Put it in a roasting tin and roast for 20 mins. Turn the oven temperature down to 180°C/350°F/Gas Mark 4. Pour stock into the roasting pan and cook for 2½ hours, adding more stock or water if it starts to dry out. Put the rest of the stuffing in a dish and bake it separately for 30-40 mins. 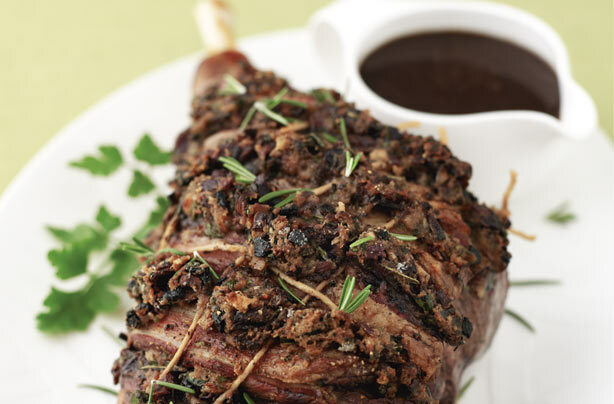 Remove lamb from the oven and put on a hot platter. Cover it with foil and leave to rest for 30 mins. Garnish with rosemary. Use pan juices to make gravy, adding wine, if using, more stock or water to the juices and thickening with flour or gravy granules.